Amsterdam is one of the most beautiful cities in the world, where you can easily while away the time absorbing the vibe, looking at centuries-old buildings, and watching people. Yvonne and I met at central station and our goal was a leisurely stroll through the Jordaan and then to partake in a high tea; the English tradition being surprisingly popular with Dutch ladies. We made our way to the Jordaan, where the Farmer’s organic market is held each Saturday. Magic seeing lots of lovely fresh produce, as well as other goodies. All the browsing left us a little thirsty, so Yvonne recommended coffee and the ‘best apple pie in Holland’ at Cafe Winkel 43. She wasn’t wrong as we patiently waited our turn to grab a piece of steaming pie fresh out the oven. YUMMY! 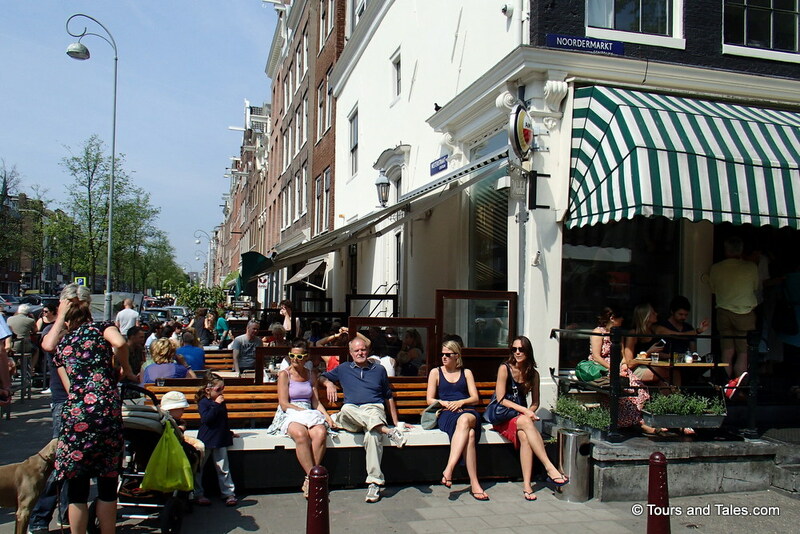 We meandered our way to PC Hoofdstraat; the high street to be seen shopping in. At those prices, I was more than happy only sticking my nose in to take a pic. We visited all kinds of interesting stores and stopped to listen to the ‘draaiorgel’ a traditional mobile organ. Still satiated from the unexpected apple treat, and expecting scones and cucumber sandwiches, I was a little disappointed with the high tea. The pastries were a tad greasy, the sandwiches a little weird and I could only swallow one spoon of the overly sweet cake. Note to self: go to London and see how it’s done there! Fortunately it didn’t dampen our day out. The sun was shining, we’d enjoyed fab markets, caught up on some natter.